Anglo-Saxon England refers to the period of English history from the end of Roman Britain and the establishment of Anglo-Saxon kingdoms in the fifth century until the Norman Conquest of England in 1066. The fifth and sixth centuries are known archaeologically as Sub-Roman Britain, or in popular history as the "Dark Ages"; from the sixth century larger distinctive kingdoms are developing, still known to some as the Heptarchy; the arrival of the Vikings at the end of the eighth century brought many changes to Britain. By the end of the Anglo-Saxon period, England had taken the shape of the country that continues to be the Kingdom of England now within the United Kingdom of Great Britain and Northern Ireland. Through the sub-Roman period of English history, there is a strong cultural link back to the period of Roman occupation. Throughout the long Anglo-Saxon period of England's history, the kingdoms existed as an off-shore island of continental Europe. England was not, for most of this period, politically or culturally involved in wider European affairs. Relations were closer with Scandinavia than with central Europe, despite the geographical proximity of the French coast. When the Anglo-Saxon period ended and the Norman period began, this comparative isolation from Europe also ended. Until today, the English monarchs bear the title "Duke of Normandy." England also became embroiled in a series of European wars and for several centuries also governed territory on the European continent. This brought England into the context of a larger entity, that of Europe. The subsequent mixture of Anglo-Saxon and Norman French cultures became, over the years, a foundation for integrating England into the European cultural life. Eventually, after losing her last European possession in 1558, England embarked on a global imperial program, acquiring the largest empire the world has known. Many British thought their ascendancy providential, part of the divine plan. Anyone who believes that history is not merely a series of accidents might well see God's hand behind the creation of an empire that, despite all the ills of an imperial system imposed on unwilling subjects, also left a cultural, literary, legal and political legacy that binds people of different religions and races together and linking people culturally back through the different periods of England's history to the Classic Age of Rome and Ancient Greece. There is a wide range of source material that covers Anglo-Saxon England. The main narrative sources are Bede's Ecclesiastical History and the Anglo-Saxon Chronicle. A range of laws are available back to the reign of Æthelberht of Kent, though they become far more numerous after the reign of Alfred the Great. Charters (usually land grants) provide us with a wide range of evidence across the period. Other written sources include hagiography, letters (often between churchmen, but sometimes between political leaders, such as Charlemagne and Offa) and poetry. It is very difficult to establish a coherent chronology of events from Rome's departure from Britain, to the establishment of Anglo-Saxon kingdoms. The story of the Roman departure as told by Geoffrey of Monmouth in his Historia Regum Britanniae is dubious except as documenting Medieval legend. Kingdoms and tribes in Britain at about 600 C.E. The archaeological records of the final decades of Roman rule show undeniable signs of decay, in stagnant urban and villa life. Coins minted past 402 are rare. When Constantine III was declared emperor by his troops in 407 and crossed the channel with the remaining units of the British garrison, Roman Britain effectively ceased to exist. The island was left defenseless, and Constantine was killed in battle. In 410, Emperor Honorius told the Romano-British to look to their own defense, yet in the mid-fifth century the Romano-British still felt they could appeal to the consul Aetius for help against invaders. Various myths and legends surround the arrival of the Anglo-Saxons, some based on documentary evidence, some far less so. Four main literary sources provide the evidence. Gildas' The Ruin of Britain (c. 540) is polemical and more concerned with criticizing British kings than accurately describing events. Bede's Ecclesiastical History of the English People is based in part on Gildas, though he brings in other evidence. However, this was written in the early eighth century, some time after events. Later still is the Anglo-Saxon Chronicle, which is in part based on Bede but also brings in legends regarding the foundation of Wessex. Other evidence can be brought in to aid the literary sources. The Anglo-Saxon kingdoms of Kent, Bernicia, Deira and Lindsey it is usually argued derive from a Celtic source, which could suggest some political continuity. The more westerly kingdoms of Wessex and Mercia show little sign of following existing boundaries. Archaeologically, following burial patterns and land usage allows us to follow Anglo-Saxon settlement. Analysis of human remains unearthed at an ancient cemetery near Abingdon, England, has been claimed to indicate that Saxon immigrants and native Britons lived side by side. There is much academic debate as to whether the Anglo-Saxon migrants replaced, or merged with, the Romano-British people who inhabited southern and eastern Britain. Already from the fifth century C.E., Britons had migrated across the English Channel and started to settle in the large western peninsula (Armorica) of Gaul (France), forming what is now Brittany. Others migrated to northern Spain (Britonia). The migration of the British to the continent and the Anglo-Saxons to Britain should be considered in the context of wider European migrations. However, some doubt, based on genetic and archaeological work, has been cast on the extent of Anglo-Saxon migration to Britain. Though one cannot be sure of dates, places or people involved, it does seem that in 495, at the Battle of Mount Badon (possibly Badbury rings, Latin Mons Badonicus, Welsh Mynydd Baddon), the Britons inflicted a severe defeat on the Anglo-Saxons. Archaeological evidence, coupled with the questionable source Gildas, would suggest that the Anglo-Saxon migration was temporarily stemmed. 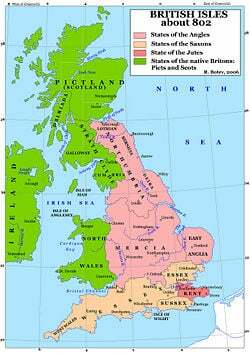 Britain about the year 802, showing the Anglo-Saxon kingdoms in red/orange and the Celtic kingdoms in green. Christianization of Anglo-Saxon England began around 600 C.E., influenced by Celtic Christianity from the northwest and by the Roman Catholic Church from the southeast. The first Archbishop of Canterbury, Augustine took office in 597. In 601, he baptized the first Christian Anglo-Saxon king, Aethelbert of Kent. The last pagan Anglo-Saxon king, Penda of Mercia, died in 655. The Anglo-Saxon mission on the continent took off in the eighth century, leading to the Christianization of practically all of the Frankish Empire by 800 C.E. Throughout the seventh and eighth centuries, power fluctuated between the larger kingdoms. Bede records Aethelbert of Kent as being dominant at the close of the sixth century, but power seems to have shifted northwards to the kingdom of Northumbria, which was formed from the amalgamation of Bernicia and Deira. Edwin probably held dominance over much of Britain, though Bede's Northumbria bias should be kept in mind. Succession crises meant Northumbrian hegemony was not constant, and Mercia remained a very powerful kingdom, especially under Penda. Two defeats essentially ended Northumbrian dominance: the Battle of the Trent (679) against Mercia, and Nechtanesmere (685) against the Picts. The so-called 'Mercian Supremacy' dominated the eighth century, though again was not constant. Aethelbald and Offa, the two most powerful kings, achieved high status; indeed, Offa was considered the overlord of south Britain by Charlemagne. That Offa could summon the resources to build Offa's Dyke is testament to his power. However, a rising Wessex, and challenges from smaller kingdoms, kept Mercian power in check, and by the end of the eighth century the 'Mercian Supremacy', if it existed at all, was over. This period has been described as the Heptarchy, though this term has now fallen out of academic use. 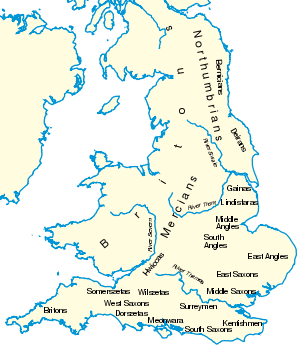 The word arose on the basis that the seven kingdoms of Northumbria, Mercia, Kent, East Anglia, Essex, Sussex and Wessex were the main polities of south Britain. More recent scholarship has shown that other kingdoms were politically important across this period: Hwicce, Magonsaete, Lindsey and Middle Anglia. Britain about the year 886, showing the Danish kingdoms in purple, Anglo-Saxon kingdoms in orange, and Celtic kingdoms in green. The first recorded Viking attack in Britain was in 793 at Lindisfarne monastery as given by the Anglo-Saxon Chronicle. However, by then the Vikings were almost certainly well established in Orkney and Shetland, and it is probable that many other non-recorded raids occurred before this. Records do show the first Viking attack on Iona taking place in 794. The arrival of the Vikings, in particular the Danish Great Heathen Army, upset the political and social geography of Britain and Ireland. Alfred the Great's victory at Edington in 878 stemmed the Danish attack; however, by then Northumbria had devolved into Bernicia and a Viking kingdom, Mercia had been split down the middle, and East Anglia ceased to exist as an Anglo-Saxon polity. The Vikings had similar effects on the various kingdoms of the Irish, Scots, Picts and (to a lesser extent) Welsh. Certainly in North Britain the Vikings were one reason behind the formation of the Kingdom of Alba, which eventually evolved into Scotland. After a time of plunder and raids, the Vikings began to settle in England. An important Viking centre was York, called Jorvik by the Vikings. Various alliances between the Viking Kingdom of York and Dublin rose and fell. Danish and Norwegian settlement made enough of an impact to leave significant traces in the English language; many fundamental words in modern English are derived from Old Norse, though of the 100 most used words in English the vast majority are Old English in origin. Similarly, many place-names in areas of Danish and Norwegian settlement have Scandinavian roots. An important development of the ninth century was the rise of the Kingdom of Wessex. Though it was somewhat of a roller-coaster journey, by the end of Alfred's reign (899) the West Saxon kings came to rule what had previously been Wessex, Sussex and Kent. Cornwall (Kernow) was subject to West Saxon dominance, and several kings of the more southerly Welsh kingdoms recognized Alfred as their overlord, as did western Mercia under Alfred's son-in-law Æthelred. 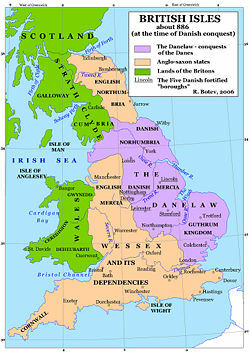 Payment of the Danegeld, however, would for centuries link Anglo-Saxon England with the Kingdom of Denmark. Alfred of Wessex died in 899 and was succeeded by his son Edward the Elder. Edward, and his brother-in-law Æthelred of (what was left of) Mercia, fought off Danish attacks and began a program of expansion, seizing territory from the Danes and establishing fortifications to defend it. On Æthelred's death his wife (Edward's sister) Æthelflæd ruled as "Lady of the Mercians" and continued expansion in conjunction with Edward. By 918 Edward had gained control of the whole of England south of the Humber. In that year Æthelflæd died, and Mercia was fully integrated with Wessex into a single kingdom. Edward's son Æthelstan was the first king to achieve direct rulership of the whole of England, following his conquest of Northumbria in 927. The titles attributed to him in charters and on coins suggest a still more widespread dominance. He defeated an attempt to reverse the conquest of Northumbria by a combined Scottish-Viking army at the Battle of Brunanburh. However, after his death the unification of England was repeatedly contested. His successors Edmund and Eadred each lost control of Northumbria to fresh Norse attacks before regaining it once more. Nevertheless, by the time of Eadred's successor Edgar, who ruled the same expanse as Æthelstan, the unification of England had been permanently established. There were renewed Norse attacks on England at the end of the tenth century. Æthelred ruled a long reign but ultimately lost his kingdom to Sweyn of Denmark, though he recovered it following the latter's death. However, Æthelred's first son Edmund II Ironside died shortly afterwards, allowing Canute Sweyn's son, to become king of England, one part of a mighty empire stretching across the North Sea. It was probably in this period that the Viking influence on English culture became ingrained. Briefly, the Danish and English kingdoms were united. Rule over England fluctuated between the descendants of Æthelred and Canute for the first half of the eleventh century. Ultimately this resulted in the well-known situation of 1066, where several people had a claim to the English throne. Harold Godwinson became king as he claimed that he was appointed by his brother-in-law, Edward the Confessor, on his deathbed, and his ascendency was confirmed by the Anglo Saxon council known as the Witenagemot. However William of Normandy, a descendant of Æthelred and Canute's wife Emma of Normandy, and Harald Hardraader of Norway (who invaded Northumberland at York two weeks before and separately from William and who was aided by Harold Godwinson's estranged brother Tostig) both had a claim. Perhaps the strongest claim went to Edgar the Ætheling, whose minority prevented him from playing a larger part in the struggles of 1066, though he was made king for a short time by the English Witenagemot. Æthelred had married Emma to align himself with her father, the Duke of Normandy. She later re-married the conquering Dane Canute the Great (994/995 – November 12, 1035). Harold Godwinson defeated Harald of Norway and Tostig at the Battle of Stamford Bridge, but fell in battle against William of Normandy at the Battle of Hastings. William began a program of consolidation in England, being crowned on Christmas Day, 1066. However, his authority was always under threat in England, and the little space spent on Northumbria in the Domesday Book is testament to the troubles there during William's reign. Throughout the long Anglo-Saxon period of England's history, the kingdom existed as an off-shore island of continental Europe. England was not, for most of this period, over-involved in wider European affairs. Relations were closer with Scandinavia including periods of vassalage and of union than with central Europe, despite the geographical proximity across the English Channel of central Europe's northern shore. When this period ended and the Norman period began, this comparative isolation from Europe also ended. Until today, the English monarchs bear the title "Duke of Normandy." England became embroiled in a series of European wars and for several centuries also governed territory on the European continent. This brought England into the context of a larger entity, that of Europe. The subsequent mixture of Anglo-Saxon and Norman-French cultures became, over the years, a foundation for integrating England into the European cultural life. Eventually, after losing her last European possession in 1558, England embarked on a global imperial program, acquiring the largest empire the world has known. Many British thought their ascendancy providential, part of the divine plan. Anyone who believes that history is not merely a series of accidents might well see God's hand behind the creation of an empire that, despite all the ills of an imperial system imposed on unwilling subjects, also left a cultural, literary, legal and political legacy that binds people of different religions and races together and linking people culturally back through the different periods of England's history to civilizations of the ancient Mediterranean world. Campbell, J. et al. 1991. The Anglo-Saxons. London, UK; New York, NY: Penguin Books. ISBN 9780140143959. Howarth, David. 1981. 1066 The Year of the Conquest. Harmondsworth, Middlesex, UK; New York, NY: Penguin. ISBN 0140058508. Karkov, Catherine E. 1999. The Archaeology of Anglo-Saxon England: Basic Readings. Abingdon, Oxford: Taylor & Francis, ISBN 0815329164. Lacey, R., and D. Danziger. 1999. The Year 1000: What Life Was Like at the Turn of the First Millennium. London, UK; Boston, MA: Little, Brown. ISBN 9780316558402. Savage, Anne. 1996. The Anglo-Saxon Chronicles. Godalming, UK: Coombe Books ISBN 1858334780. Stenton, F.M. 1971. Anglo-Saxon England, 3rd edition. Oxford, UK: Clarendon Press. ISBN 9780198217169. Medievalists.net - extensive resources on the medieval period. This page was last modified on 9 June 2016, at 20:58.